Turkey's Prime Minister, Recep Tayyip Erdogan, is returning an award he received in 2004 from the American Jewish Congress, which has accused him of "dangerous rhetoric" against Israel. Last week the New York-based lobby group said Mr Erdogan was "inciting the Turkish population to violence against the Jewish people". It asked him to hand back the award, granted for Middle East peace efforts. 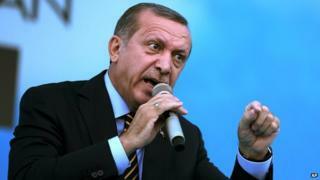 Turkey's ambassador to the US said Mr Erdogan would be "glad" to do so. Ambassador Serdar Kilic said Mr Erdogan should not be expected to turn a blind eye to Israel's actions in Gaza and the West Bank. "Attempts to depict Prime Minister Erdogan's legitimate criticisms of the Israeli government's attacks on civilians as expressions of anti-Semitism is an obvious distortion and an effort to cover up the historical wrongdoings of the Israeli government," Mr Kilic said in a letter quoted by the Turkish news website Hurriyet. Mr Erdogan is campaigning to be elected president next month and has sharply criticised Israel's military offensive against Palestinian Hamas militants in Gaza, where more than 1,100 people have died, most of them civilians.